Researchers have shown in a mouse model of multiple sclerosis that phagocytes can both promote and inhibit inflammation in the central nervous system, sequentially adopting different phenotypes with distinct functions. The role of mononuclear phagocytes in multiple sclerosis (MS) has been a puzzle to scientists. These immune cells are the first on the scene of the developing lesion, igniting an inflammatory response. And then they initiate a cleanup process to help resolve and repair the damage. Are they different phagocytes with opposing jobs? A team of German scientists designed experiments to understand this vexing phenomenon — and the surprising answer may offer the possibility of a new treatment target. “These are relatively plastic cells and have the capacity to destroy tissue and to clear up damaged tissue,” said Martin Kerschensteiner, MD, PhD, director of the institute of clinical neuroimmunology at the University Hospital and Biomedical Center at the Ludwig-Maximilians University in Munich and senior author of the paper in the September issue of Nature Neuroscience. The scientists showed that these phagocytes are not two different cell types — one pro-inflammatory and one anti-inflammatory — but that they change roles in response to specific environmental cues. “These cells are capable of exhibiting both pro- and anti-inflammatory phenotypes,” Dr. Kerschensteiner said, adding that blocking the entry of phagocytes into the central nervous system (CNS) could slow or stop the disease process. Many scientists have puzzled over these cells. Based on the polarization these cells can acquire in cell culture, they have even labeled two types of activity: M1 phagocytes for cells that have a pro-inflammatory polarization and M2 cells to describe the anti-inflammatory state. The M1s release toxic reactive species, while M2s send signals that are in line with classic phagocytosis — cleaning up tissue debris and repairing the cells in the surrounding area. Scientists have further identified molecular signatures that characterize M1s and M2s. There is a pair of enzymes that compete for intracellular substrate l-arginine. M1s express induced nitric oxide synthase and M2s use arginase to catalyze urea, l-ornithine, and polyamines, and this mix supports tissue repair. The question is what is driving this process, and are M1 and M2 distinct cell types? The German scientists used two complementary reporter mouse lines: one, in which the induction of the specific signature enzyme that characterizes proinflammatory phagocyte phenotypes results in red fluorescent labeling of the cells, and another that expresses yellow fluorescent protein under the control of the arginase promoter that characterizes anti-inflammatory cells. Yellow fluorescent protein is a genetic mutant of green fluorescent protein. In these double transgenic mice, they then induced experimental autoimmune encephalitis (EAE), a classic mouse model of MS and followed the fates of individual phagocytes. Both fluorescent colors appeared in phagocytes in the spinal cord. Most of the cells were derived from invading monocytes. The cells at the earliest stages of EAE were red. The number of cells in the lesions decreased over the course of the disease, and over days they began to see the red change to yellow and eventually green. The research team analyzed genetic transcripts and found different gene expression profiles when phagocytes were in their tissue-damaging stage and then in the tissue repair stage. The imaging allowed them to track the evolution of pro- and anti-inflammatory phagocytes as they found their way into different compartments in the CNS. The phagocytes acquired polarization once they made it into the CNS. By tagging the phagocytes with different fluorescent proteins — red to identify pro-inflammatory markers and green to tag anti-inflammatory markers — and then using an in vivo microscopy imaging technique they could directly visualize how the phagocyte population changed its phenotype. They considered two possibilities — either pro-inflammatory cells enter the CNS and do their damage at the site and leave the area as other anti-inflammatory cells come in, or the same cell changes its phenotype. They wanted to know which signals are responsible for that shift. They watched as the red fluorescent phagocytes made it into the inflamed CNS to the lesion. They were pro-inflammatory. Several days later, they watched these same cells turn green and start their anti-inflammatory process of resolving the lesion. There were not two cell types but just one, and this cell was clearly getting signals about how to proceed with the task at hand. The scientists characterized the phenotypes and found that they behaved differently on many molecular levels: ATP generation, scavenging function, and their ability to generate reactive species or cytokines. It looked as if they were getting their cues from the CNS environment. The researchers believe that this phenotypic conversion is induced by signals from astrocytes in the CNS. Without external cues, the immune cells stay red. When they are guided by signals from the CNS environment, they begin to switch their role. The discovery should enable researchers to obtain a better molecular understanding of the phenotype switch, and allow them to explore the therapeutic potential of targeted manipulation of phagocyte populations in MS patients. Other animal studies have shown that depleting phagocytes or blocking microglia activation prevents a CNS lesion, and it may be possible to see if approaches targeting phagocyte activation and actions would be safe in patients. Using these mice and in vivo imaging, the group showed that during inflammation in the CNS, the first phagocytes that enter the CNS acquire the phenotype of M1 cells and gradually, as inflammation is decreased, becomes M2 type phagocytes. •. Locatelli G, Theodorou D, Kendirli A, et al Mononuclear phagocytes locally specify and adapt their phenotype in a multiple sclerosis model https://www.nature.com/articles/s41593-018-0212-3. Nat Neurosci 2018; 21(9):1196–1208. 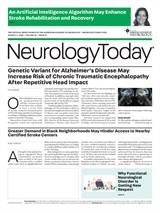 Neurology Today18(22):28-29, November 15, 2018.